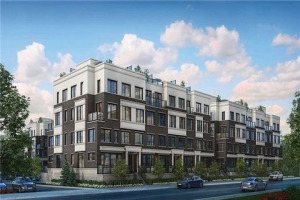 Modern End Unit Townhouse In A Sold Out Project For Sale Under Assignment, Closing In June 2019! This Beautifully Upgraded Unit Features A Large Private Rooftop Terrace, Hardwood Floors, Upgraded Modern Kitchen With Granite Countertops, 9' Smooth Ceilings On Main Level, Stainless Steel Appliance Pkg Supplied & Installed, Underground Parking Space, Locker And More! Excellent Location Close To Amenities And Highways.Free Condo Fees For 1 Year!